The park is a non-profit funded solely by donations from dog-owners like you. Calling all doggie ghouls and goblins! 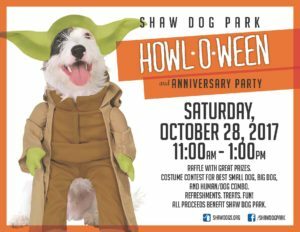 Get your pet parent to dress you up – and perhaps themselves too – and come to Shaw Dog Park on Saturday, October 28 for our 3rd Annual Howl-O-Ween party. This free event for park users and their pups will take place from 11:00 AM – 1:00 PM. Once again, the festivities will include a costume contest with $25 Amazon gift cards being awarded to top winners in three categories: best small dog (30lbs and under), best large dog (over 30lbs), and best Human/Dog combo. There is no entry fee to participate in the contest. To help raise funds for the Park, we’ll hold our ever popular raffle. 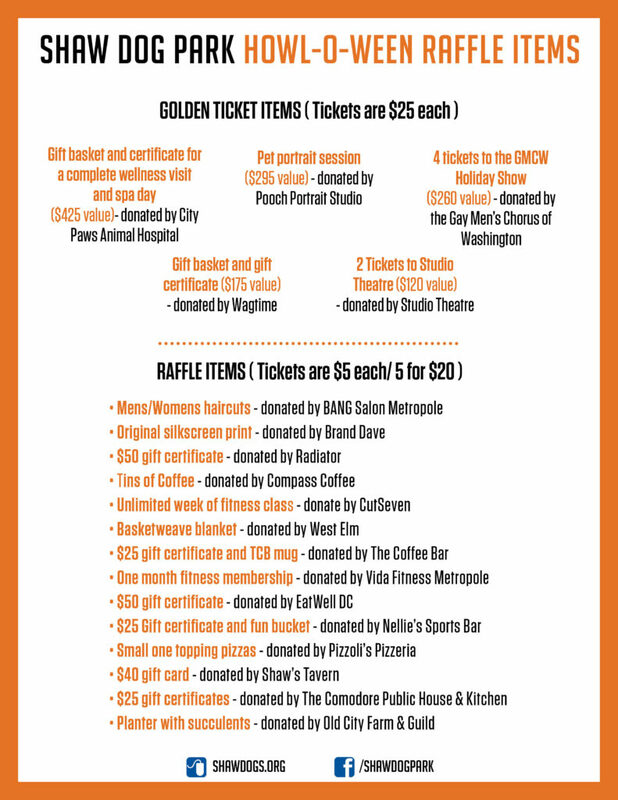 Because of so many wonderful donations from Shaw / Logan Circle / U Street businesses, we’ll be holding the standard raffle and the “Golden Ticket” raffle. See more information below. All this and more, so don’t hesitate to join in the fun! It’s time for our monthly Shaw Dog Park cleanup! This is a community-run dog park, and it takes all of us to keep it clean and enjoyable for ourselves and our pups. So let’s all have some fun with weed-pulling and experience community togetherness this Thursday, October 19 from 5:30 – 6:30 PM. Some shovels, hoes, rakes, and gloves will be available, but please bring your own supplies if you’re able! 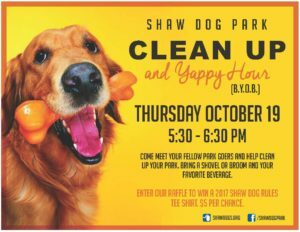 As we clean, and immediately after, mix and mingle with your fellow dog park users at our BYOB Yappy Hour! 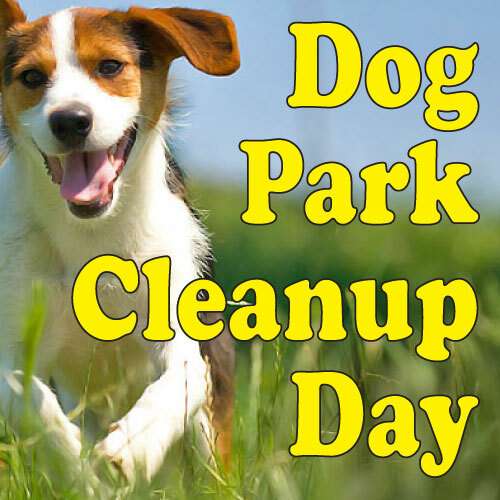 Shaw Dog Park Cleanup – This Saturday! 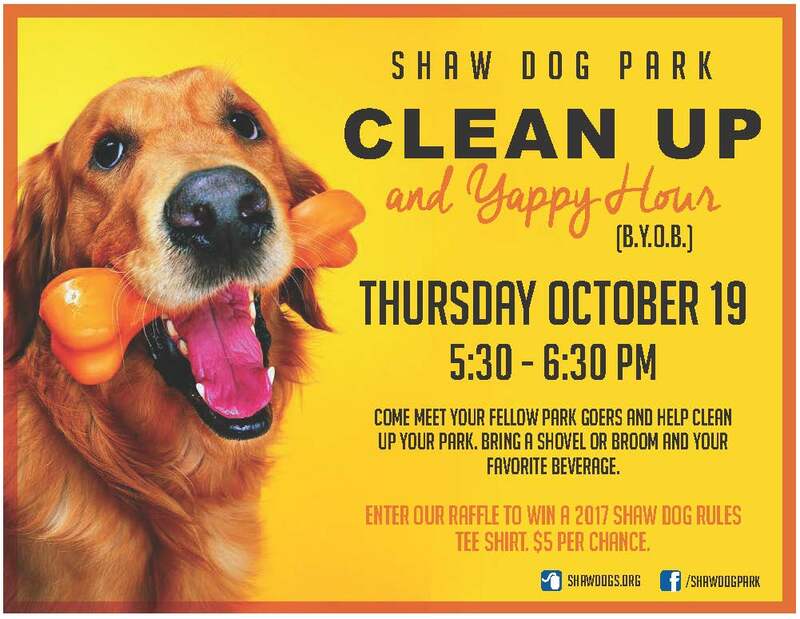 It’s time for our monthly Shaw Dog Park cleanup! This is a community-run dog park, and it takes all of us to keep it clean and enjoyable for ourselves and our pups. So let’s all have some fun with weed-pulling and experience community togetherness this Saturday, July 15 from 9:00 – 10:00 AM. Some shovels, hoes, rakes, and gloves will be available, but please bring your own supplies if you’re able! We’re hoping to focus more of our attention on the small dog park this month, which means tackling the grass overgrowth that has encroached into the small dog pen. 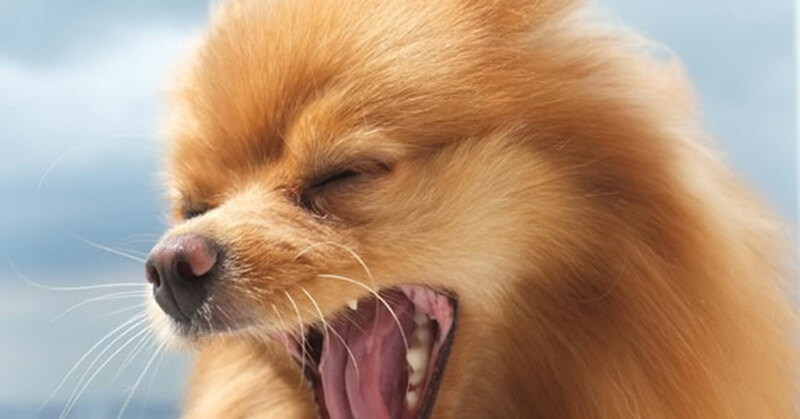 We’ve gotten recent confirmation from CityPaws Animal Hospital and Friendship Hospital for Animals that there is an active Kennel Cough Outbreak in the DC area. Our Park is in the affected area, although we do not have any reason to believe this outbreak is localized to or originated in Shaw Dog Park. As a reminder, all dogs that use Shaw Dog Park should have a DC Dog License, which requires proof that a current bordatella vaccine has been administered to the dog. If your dog is up-to-date with its vaccinations, there is little, but possible, risk of getting the disease. While kennel cough is an airborne disease, the Park remains committed to providing sanitary conditions as best as possible. We are having the Park sprayed with pet-safe WYSIWASH on Mondays & Thursdays (spraying typically happens mid-morning). We will update this web post as we learn more. Please feel free to send us a message at info@shawdogs.org if you have questions. Sending our love and best wishes for good health to every Shaw Dog Park pup! Make dinner a selfless act! Come in to the Chipotle at 1508 14th Street, NW on Sunday, July 16th between 5:00pm and 9:00pm. 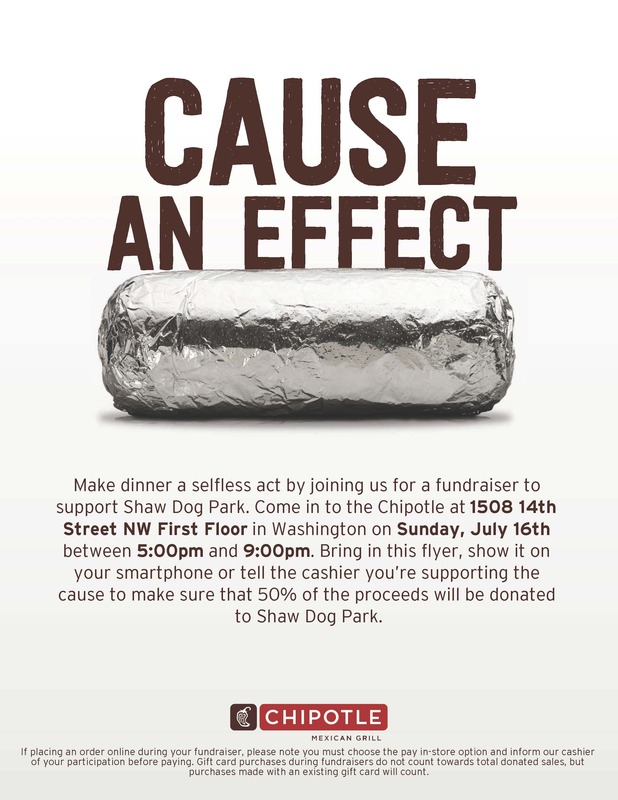 Show this flyer on your smartphone (you can click the image to enlarge) or tell the cashier you’re supporting the cause to make sure that 50% of the proceeds will be donated to Shaw Dog Park. As the Park operates in its 9th year of existence, all funds raised by this event will enable the volunteer-based Board to continue to provide basic Park maintenance and upkeep as well as pursue Park improvements. 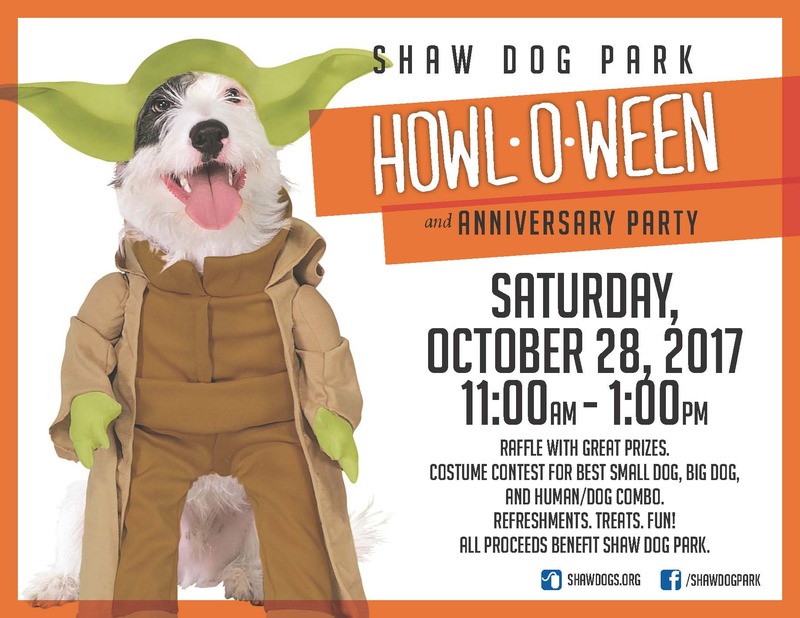 Help spread the word via our Facebook page — https://www.facebook.com/ShawDogPark/ — and share our post! 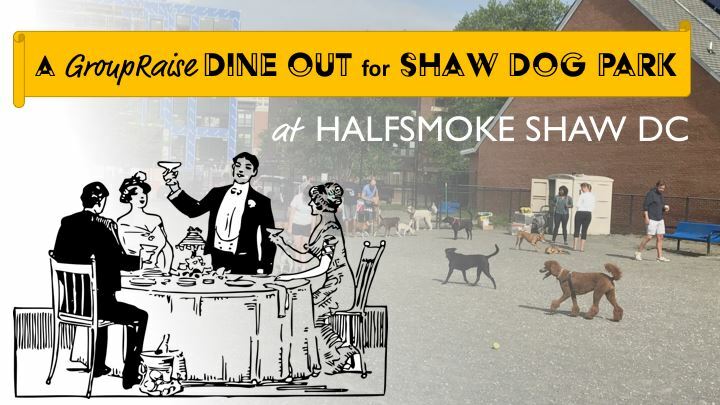 GroupRaise – an organization that brings people together in partnership with local restaurants to support local causes and non-profits – has selected Shaw Dog Park as their June 2017 beneficiary and is hosting a GroupRaise dinner at local fave HalfSmoke (651 Florida Ave NW, Washington, District of Columbia 20001) with 20% of the proceeds from dinner on Thursday, June 29 to be donated back to the Park. Want to help out and join the (delicious) fun? Second: Tell your neighbors! Bring your friends! Guilt your co-workers! The more the merrier and the more we get back! Third: Join us from 4 PM – 9 PM on Thursday, June 29 to enjoy some awesome sausages, brews, and more – all to benefit Shaw Dog Park. It’s that time of year! We’re calling on our fantastic Shaw Dog Park community to join us for the Annual Meeting and talk all things dogs, park, and another great year. • Have delicious drinks and food! 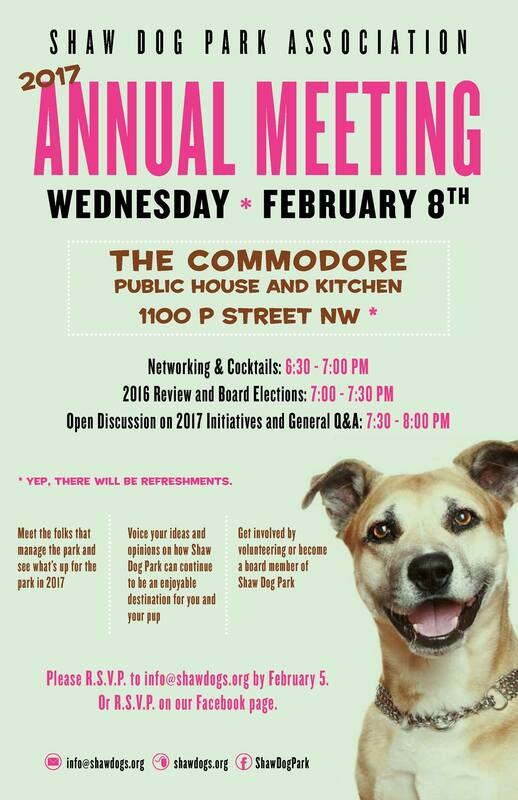 The 2017 Annual Meeting will be held Wednesday, February 8 at 6:30 PM – 8 PM at The Commodore Public House & Kitchen (1100 P St NW, Washington, District of Columbia 20005). Tell your dog park friends, share the word, and let us know if you will be attending by Monday, February 5th so we can make sure to get enough snacks for all! 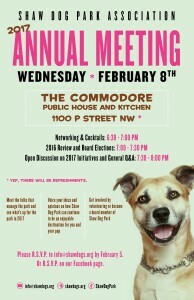 RSVP via the Annual Meeting’s Facebook Event page or email us at info@shawdogs.org. Curious about serving on the board? Want to nominate yourself (yep, that’s allowed!) or someone else? Send us an email at info@shawdogs.org. Click here for more information about board duties and responsibilities. 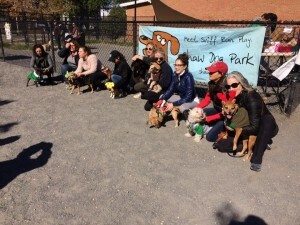 The Shaw Dog Park Association seeks enthusiastic and dedicated members of the community to join its executive committee and board of directors. We are currently inviting immediate applications for president, vice president, treasurer, and secretary, as well as for positions on the board of directors. In addition to specific duties for each position, everyone on the SDPA contributes equally during park maintenance and community outreach activities. Time commitment is only a few hours every month. Please email info@shawdogs.org with your name, contact information, and a brief statement of interest. We anticipate filling vacancies at our Annual Meeting on Wednesday, February 8, 2017 in order to begin planning for projects for the forth-coming year. Even if you’re not interested in an official role, we still need your help! • Administer all affairs of the organization, and control all expenditures and property of the organization. • Call and administer all annual and special members’ meetings. • Hold regular monthly board meetings to attend to and administer on-going planning, financial and operational needs of the organization. • Appoint the officers of the organization. • Create standing and ad hoc committees. • Serve as general manager of the organization and shall supervise, direct, and control the organization’s activities, business affairs, and officers. • Preside at all members’ meetings and at all board meetings. • Serve as ex-officio member of all committees created by the board. • Serve as the organization’s focal point and the principal spokesperson for all park project planning meetings with city personnel. • In absence of the president or secretary, shall perform duties of those offices and as otherwise directed by the president. • Keep an accurate book of accounts of the organization’s properties and transactions. • Receive, collect, and deposit all funds. • Prepare a written financial report for each annual members meeting and for each monthly board meeting. • Record meeting minutes at annual meeting, monthly board meetings, and committee meetings (if applicable). • Notify members of regular meetings. • Keep a current book of members’ records. Each standing committee shall consist of two or more members. Be fierce, Shaw Dog Park users! 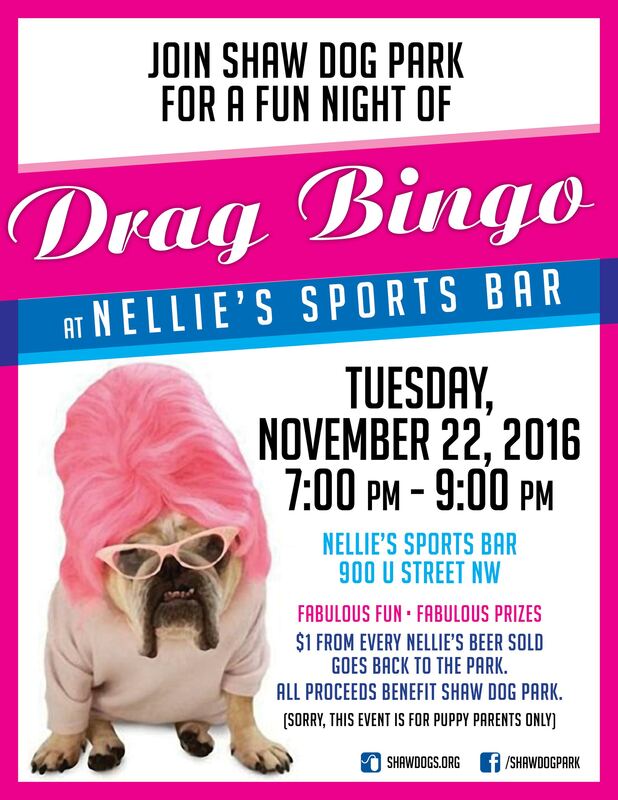 Join members of the Shaw Dog Park Association Board and fellow park users for a fun night of Drag Bingo at Nellie’s Sports Bar (900 U Street, NW) on Tuesday, November 22, 2016 from 7 – 9 PM. How does this event help the Park? 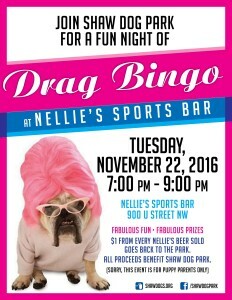 $1 from every Nellie’s Beer sold comes back to the Park. Thanks to everyone for joining us for a great Howl-o-ween this past Saturday and supporting the Park! We were blown away with the great turnout this year and very grateful to all of the local businesses who donated items to the raffle and to all the wonderful dogs and their humans who came out to participate. Click here to view pictures from the event on Shaw Dog Park’s Facebook page. Subscribe to our monthly newsletter for news and upcoming events. If you're interested in helping to maintain and run the park please send us an email.